This issue we are giving the sewing machine some loving with a fun sewing machine cover by Cheryl Houghton. 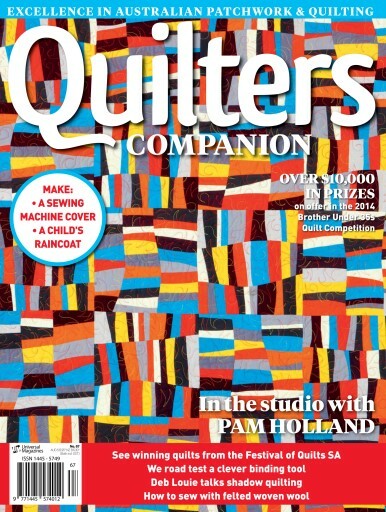 There is also some lovely pieced quilts to make from Brenda Gael Smith (on the cover), Jessica Frost and Jane Morgan. We also have Sharon Keightley’s interpretation of the traditional basket block Natashia Curtin’s stunning Seasons quilt. Finally the ladies from The Quilted Crow are back to share more of their expertise in working with felted woven wool as well as a delightful project on which you can hone your skills. 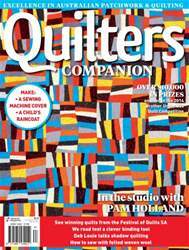 We catch up with Pam Holland in her studio, Michelle Marvig road tests The Shortcut Binding Tool and Deb Louie looks at how less quilting is actually more.